On an unseasonably cold day in June, I am preparing to meet with Paul Resika, a remarkable man and a brilliant artist, to discuss his current exhibitions at both the Provincetown Art Association and Museum and the Berta Walker Gallery. 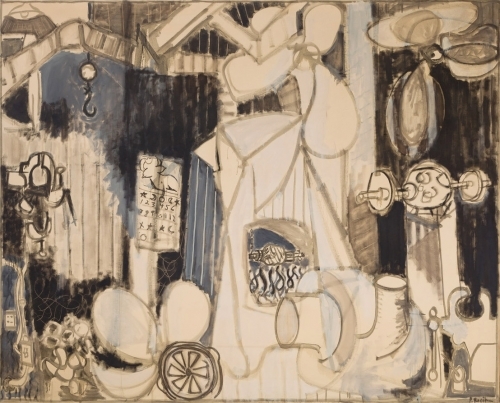 A painter who has created “thousands of pictures” (as he calls them), he was given his first show in 1948 at the age of 19 with George Dix Gallery on Madison Avenue in New York. Resika was already a serious artist, having studied at age 12 with Sol Wilson and at 17 with Hans Hofmann. A prodigy will often burn out his candle at a young age, but that is not the case at all with Resika; he has a body of work spanning almost eight decades. Our scheduled appointment is at the Berta Walker Gallery in Provincetown, where he is represented by his longtime friend. Arriving early at the vibrant Bradford Street space, I am greeted by new managing director Grace Hopkins. She and Walker have just installed an extraordinary show, “Hans Hofmann (1880-1966) and Blanche Lazzell (1878-1956).” In one of the rooms, an exquisite group of pen and ink drawings by the master teacher are shown alongside woodcuts and gouaches by his former student, modernist Lazzell. This is the perfect place to engage in a conversation about art with Resika, who studied with Hoffmann here in Provincetown during the summer of 1947. Back in the states, Resika would go on to create landscapes, interiors and figurative works that became his vehicles for color, form and volume to the present day. Flowers, boats, lighthouses, nudes, woods, the moon and a beach were abstracted into forms that are familiar but not representational in the traditional sense. Resika created these series of different motifs with great self-assurance and a fearlessness to explore paint on canvas. We can see his visual progression from the representational “Woman Crossing a Bridge (Vaucluse),” completed in 1968, to “The Striped Cat,” painted in 2003. Both are images of a woman, but the classic sense of perspective is done from the later piece; the figure is anchored dimensionally in the composition with a luminescent vibrat yellow. Berta Walker represented Resika for five years in New York City at Graham Modern Gallery, and then since 1997 at her own gallery after Long Point Gallery closed. “What resonates for me with Paul’s work is his extraordinary use of color; the light emanates from his art in a wat that is almost indescribable,” Walker said. “Even in a night painting, he brings a glow that speaks to the soul of his viewers.” This is clearly evident in “Moon and Geometry,” one of the landscapes selected for this exhibit. Reluctant to talk about himself, we move the conversation to the challenges of today’s emerging artists. When asked what he would do if he was just starting out, Resika said, “If you want to sell a painting, buy a painting.” He will talk about his own extensive collection with art historian and writer Jennifer Samet, Ph.D in a panel called “The Artist as Collector with Jennifer Samet and Paul Resika,” a public event on August 25th at PAAM. Resika has been both a participant and a witness to some of the most noted teachers and art movements in the twentieth century. The two concurrant shows are humbling, moving and filled with joy. Do what it takes to get to Provincetown to see these exhibitions.